Say hello to the most popular WordPress OneDrive plugin! 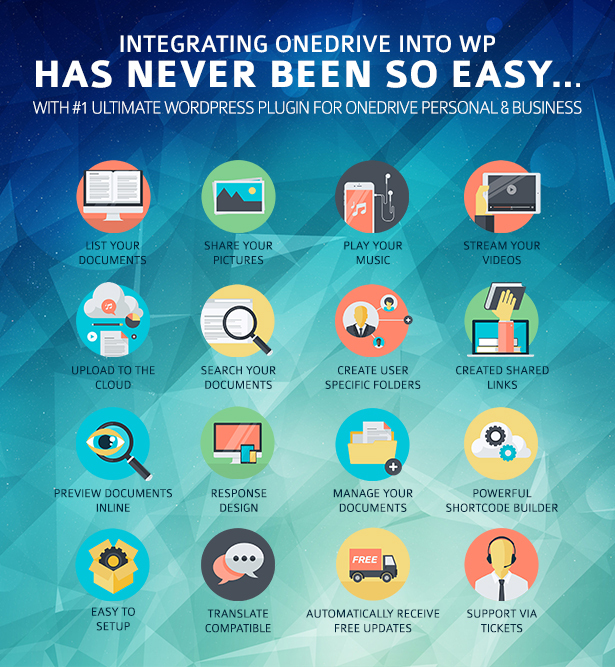 ShareoneDrive is a user-friendly, highly customizable, innovative OneDrive integration plugin for WordPress that displays your OneDrive or OneDrive Business (Sharepoint) files in a beautiful way. No coding skills required! ShareoneDrive – current version 1.8 available for download! Say hello to the most popular WordPress OneDrive plugin! ShareoneDrive is a user-friendly, highly customizable, innovative OneDrive integration plugin for WordPress that displays your OneDrive files in a beautiful way. No coding skills required! Link your OneDrive account to the plugin with just 1 click! 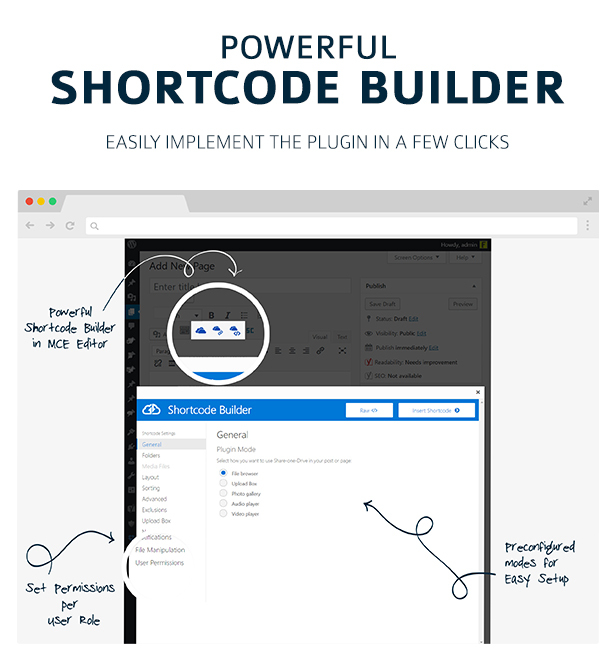 Insert the Shortcode and publish your page! 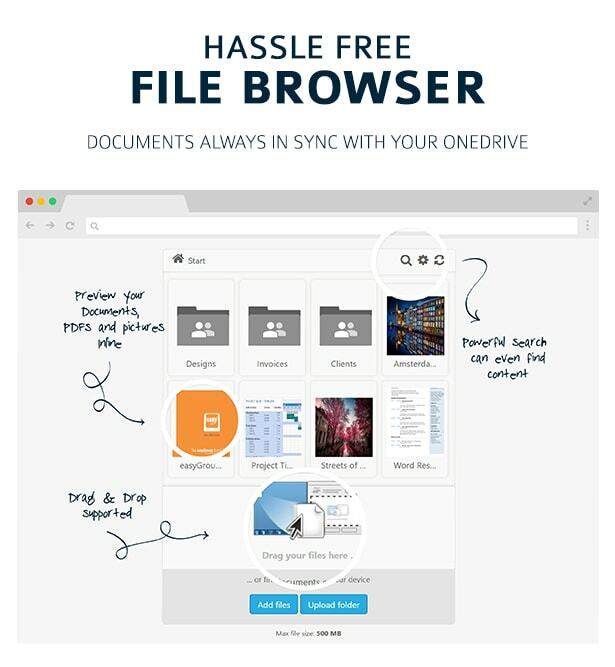 Share-one-Drive is the #1 Ultimate OneDrive plugin for WordPress on the market – and part of a series of Cloud Plugins already powering 5.000+ company websites improving their workflow. Join now and start using your OneDrive even more efficiently by integrating it on your website! Looking for the best solution to manage your Documents on a WordPress site? Just use this File Browser and manage your Documents easily via the OneDrive platform. The File Browser will make sure that your files are automatically shown on your WordPress site. Tired of the process of uploading, selecting and building your gallery on a WordPress site? 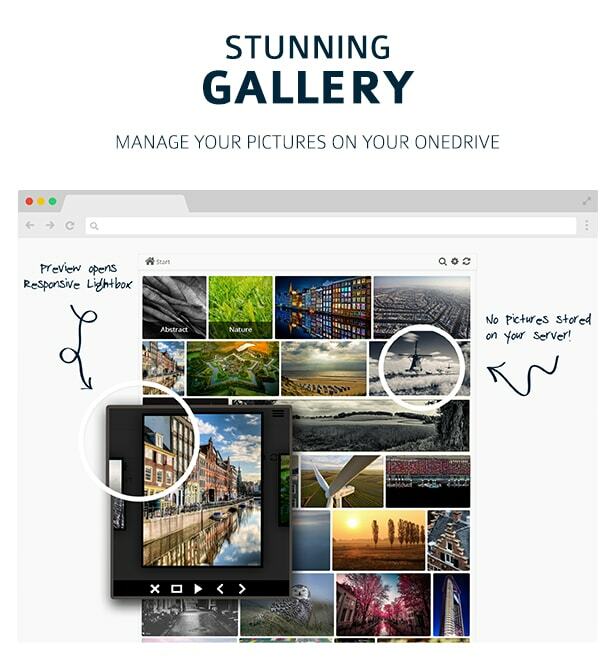 The ShareoneDrive Gallery will automatically build an amazing Gallery from your OneDrive Folders. 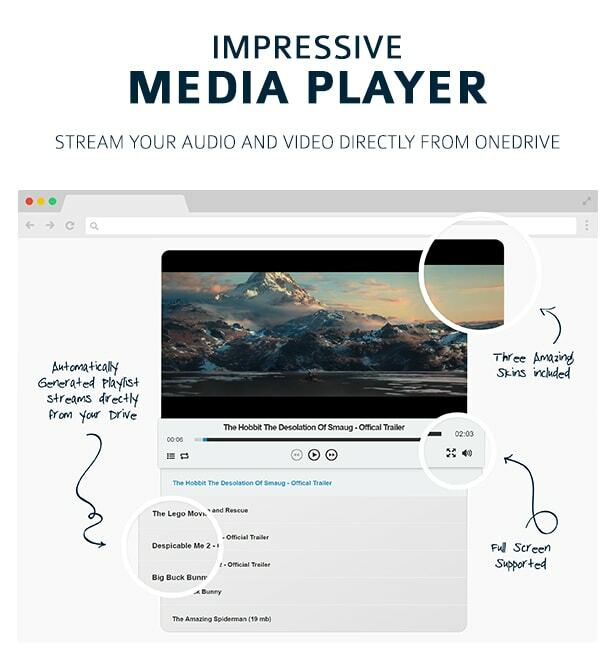 Stream media directly from your OneDrive with a HTML 5 mediaplayer with flash-fallback. Supported formats: mp3, mp4, m4a & m4v (AAC/H.264), oga & ogv (Vorbis/Theora), webmv (Vorbis/VP8). The plugin comes with a nice Upload Box which allows your users to upload Files directly to your OneDrive. This Box is extra powerful in combination with the User Folder feature, which allows you to create a Client Area on your OneDrive. Let your users search your files by file name and extension. You also have the ability to use the full-text search which allows you to search beyond the names of your files. Directly see your Documents or Pictures in an amazing Lightbox that is included in the plugin. ShareoneDrive is also able to render your almost every kind of Document so people don’t need to download them before they can see the contents. Just want to embed Documents directly on your WordPress Page or Post? You can use the ShareoneDrive Embed button in the WordPress Editor and the plugin will make sure that your selected documents are nicely integrated into your page. Create a shared link if you want anyone to be able to click a link to access your file. People don’t need a OneDrive account to view your file. Easily and securely share documents via OneDrive with your clients. The User Folders feature allows your clients to preview, download and upload documents to their own private folder. You can link your WordPress Users manually to their own folder or let the plugin handle this for you! OneDrive can ease the burden on your server, reducing disk space by storing your website’s heavier elements externally. Instead of copying files to your server, this plugin will manage the files directly on OneDrive. Users will download files directly from OneDrive increasing performance and saving you bandwidth! The Media Player has multiple nicely designed skins included which can easily be selected via the plugin settings. The plugin perfectly integrates into the WordPress User system allowing you to select which User Roles should have the permission to view, download, upload, rename, delete files or folders. Adding ShareoneDrive has never been easier! Although it has an impressive number of options, even beginners will manage to implement the plugin to their wishes with our intuitive workflow. Do you want to track if someone downloads & uploads files? The notification system can send you customizable emails when this happens! In combination with the OneDrive App notifications, you will immediately know when a client needs your attention! Good looks aren’t everything, so we made sure that ShareoneDrive also loads lightning fast! Our intelligent Caching System will make sure that everything is running smoothly! ShareoneDrive uses the most advanced and most effective programming patterns, to get the best results for your site. ShareoneDrive integrates nicely into WooCommerce and it allows you to select your Digital Products from OneDrive! Do you want more flexibility than the Upload Form that is included? Useyourdrive seamlessly integrates into Gravity Form allowing you the create the perfect Form! Your content will look great on both desktop and mobile sites whether it is a File Browser, Gallery, Upload box or a Media Player. First released in 2013, our plugin has since then been constantly been improved in terms of features, usability and beginner-friendliness. When you have questions, comments or problems, just create a Ticket! We offer automatic updates, free of charge. Stay up to date with ShareoneDrive and receive our latest releases and enhancements. At least PHP 5.4 with cURL extension (available on almost all servers). PHP 7.0+ recommended.